9 HGH gut and Palumboism. What is the difference? 10 When has GH gut appeared? 13 How can I avoid HGH gut and Palumboism? This article will deal with such a relevant problem in professional bodybuilding as HGH gut and palumboism. You will learn about their possible origins, history of occurring, and differences between GH gut and palumboism. Also, we will discuss facts, myths, and assumptions connected with this topic. HGH gut and Palumboism. What is the difference? GH gut is the extremely enlarged belly in bodybuilders. It is noticeable especially when athletes have a ripped body. In this case, they have got six packs, but their waist is very wide, and the belly is bloated. That is why HGH gut is also called the syndrome of a pregnant bodybuilder. Palumboism is a medical condition in which the belly is bloated, and limb muscles are atrophied at the same time. The strange name is derived from Dave Palumbo, the father of Palumboism. You can see his physique on the picture. The phenomenon is very rare, and its origins are unknown yet. In the bodybuilding community, it is considered that Palumboism is a kind of hormonal disease. However, it is just a speculation because the research hasn’t proven this hypothesis yet. We will discuss it later. Shortly, Palumboism = GH gut + muscle athrophy. When has GH gut appeared? 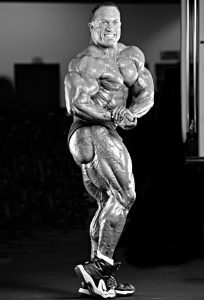 First bloated bellies have been noticed in the 1990s when Dorian Yates became Mr. Olimpia and took the place of Lee Haynee. 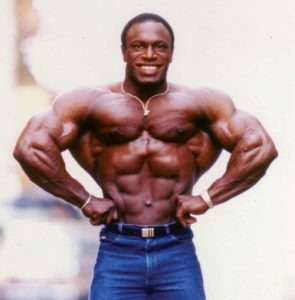 It is widely considered that Yates was the first professional bodybuilder to have HGH gut in professional bodybuilding. 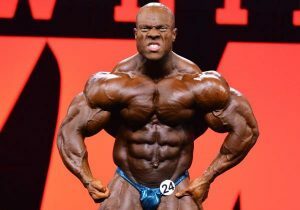 However, Dorian did not mention HGH talking about his cycles in the interviews, just traditional steroids. It can be true, but later bodybuilders, from Coleman, have definitely started using growth hormone, and it is an intrinsic drug for bodybuilding today. Some people claim that gut enlargement is caused by the overall rise in mass, not with growth hormone. If you look at three holders of the Mr. Olimpia title in the 1980s and 1990s, you will see a tremendous rise in muscle mass. Lee Haynee weighed 110 kg and was 180 cm tall, Yates had 120 kg of weight and was 177 cm tall, and Ronie Koleman has 138 kilos of ripped mass and 180 cm of height. So, according to the hypothesis, belly enlargement is connected with the need to maintain much bigger muscles than before. 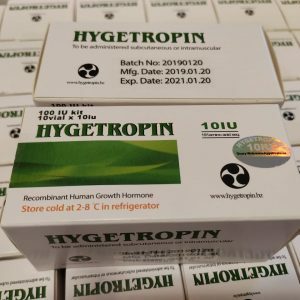 The main factor of its occurring is that HGH influences receptors in smooth muscle tissues of internal organs through IGF-1 and makes the organs rise. Prolonged and excessive HGH usage. 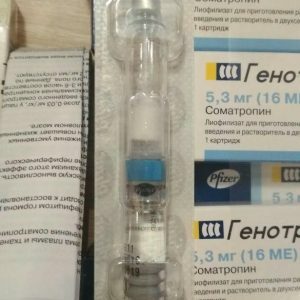 Professional bodybuilders take steroids and growth hormone almost a whole year, and the dosages of HGH are about 15-30 IUs every day for half a year without pauses. Combinations with other drugs. 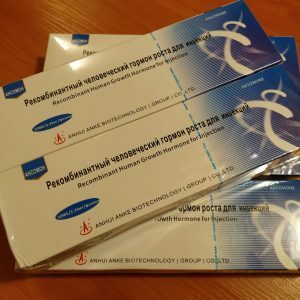 Pro BBs do not take HGH alone, only in conjunction with steroids and insulin to get the synergy effect. However, the synergy rise also affects internal organs, which grows rapidly. An enormous amount of food. Jay Cutler once said that the only his job was to eat, and it is the hardest part of bodybuilders’ life. Professionals consume 6-7 thousands of calories every day, divided into 7-8 meals, so they need to take 800-900 calories each time. Try to consume such amount of food, and your stomach will become bloated. And what if you ate like this eight times a day? Your belly would be enlarged the whole day, and HGH, steroids, and insulin would only enhance this process. Maintenance of large muscles requires big muscles of spine and abs, so the waist rises. HGH gut is likely to have complex origins. HGH+insulin+steroids abuse and excessive food consumption are the main reasons. Another proof that the bloated belly is not caused only by HGH is that Olympic athletes who take HGH too don’t have big guts. Myth 1. GH gut is irrevocable. Fact 1. The belly returns to its normal size after the conditions that influence it become normal again. This fact can be illustrated by two examples: Dorian Yates and Phil Health. Dorian, who had GH gut during his career, doesn’t have it now. (photo). The second example is Heath, who had the big belly during the 2013-2014 Mr. Olimpia competition, but it was not noticeable during the 2015 competition as it disappeared, and his waist returned to its size. Assumption 1. The stomach is very elastic and can easily change its volume from normal 1-liter size to 4 and even 6 liters when it is full or distended in other ways. However, when mechanical distension ends, the normal size restores. Myth 2. Bodybuilders of the golden era did not use HGH. Fact 2. 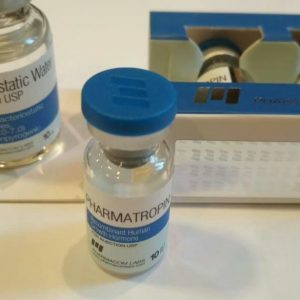 Growth hormone has been available on the market since its first extraction from the cadaver pituitary in 1956. 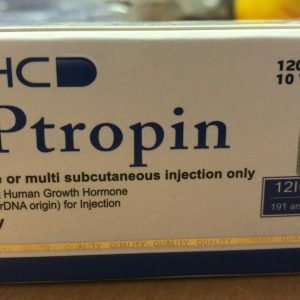 With the time, extraction from the pituitary became more and more widespread, and it was easy to get HGH in the 1980s. 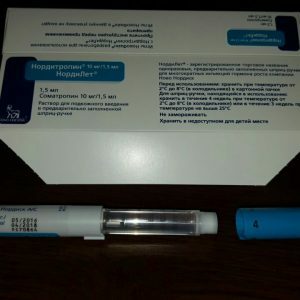 As recombinant growth hormone was synthesized in 1985, HGH became highly available for bodybuilders, and they certainly used it. Assumption 2. Bodybuilders of the golden era used HGH, but they took lower doses than today as the hormone was extremely expensive, so the problem of HGH gut did not exist. Myth 3. Growth hormone in any dose leads to GH gut. Fact 3. This side effect was neither observed nor fixed by scientists that had researched the use of somatropin for anti-aging therapy. Assumption 3. 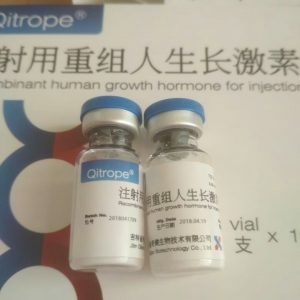 Growth hormone, when you do not abuse it, doesn’t lead to internal organs enlargement because the anabolic potency is concentrated in skeletal muscle tissue. How can I avoid HGH gut and Palumboism? Do the vacuum exercise to keep internal abs muscles toned. Palumboism got the name because of its “father” Dave Palumbo, who is an illustration of this phenomenon. As seen on the photos, Daves physique has been significantly changing during his career. Young Palumbo had a great body, but then things went badly, and his physique had started changing. His belly grew, and other muscles diminished. 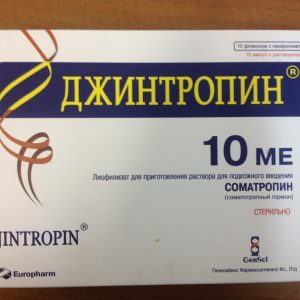 Palumboism is believed to be a kind of a hormonal disorder caused by the use of HGH in combination with other drugs. Myth 1. Palumboism is a disease. Fact 1. This idea does not have any scientific evidence and is grounded on few examples. Assumption 1. Palumboism is a speculation. Myth 2. Palumboism is caused only by growth hormone, insulin, and steroids. Assumption 2. Palumboism, if it exists at all, is a genetically caused response to effects of some drugs. Myth 3. Palumboism is a common problem in bodybuilding. Fact 3. There are only few examples of palumboism. Assumption 3. 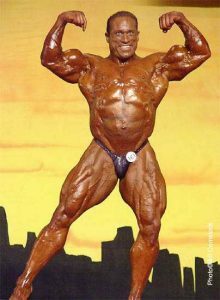 The photos of Dave Palumbo, which are used to illustrate palumboism, were made during a guest posing, when Dave had already finished his career, so the illustrations of his awful physique are not representative. GH gut has a complex nature: abuse of HGH, insulin, and AAS, which are combined with enormous food consumption. Distension disappears when the stomach returns to normal conditions. Palumboism seems to be just a speculation, even a myth without scientific evidence as it is grounded on too few examples.